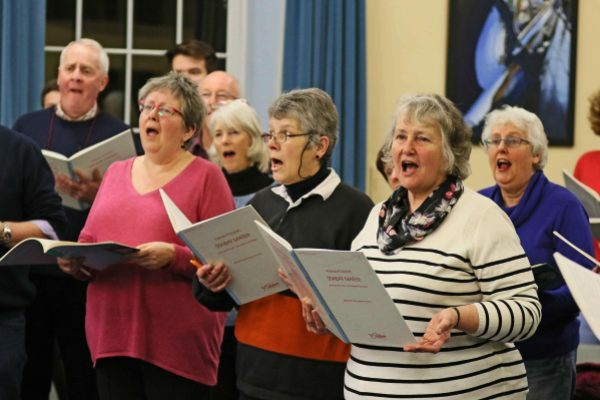 Singing with Hereford Choral Society is a very special experience. We are a chorus of approximately 150 singers, directed by Geraint Bowen, the Organist and director of Music at Hereford Cathedral. We perform three concerts each season in November, December and March, always with an orchestra and in the fabulous acoustic of Hereford Cathedral. Each summer about a third of our members help to make up the Three Choirs Festival Chorus, singing with internationally acclaimed conductors, solo artists and the Philharmonia Orchestra. In February 2018 Hereford Choral Society was invited to perform with Hereford Cathedral Choir in a special concert for Prince Charles in the Great Ballroom of Buckingham Palace. We rehearse every Monday evening from September to the final concert of the season in March. Rehearsals start at 7.30pm and end at 9.15pm prompt. To perform in the concert you may only miss three rehearsals for each of the November and March concerts, but must attend all rehearsals for the annual December performance of Messiah. Contact our Membership Secretary (or call 08454 633104). Come along to our Open Rehearsal to see if you like it. Undertake a short audition with our Conductor and accompanist. You will be given a short voice test and asked to sing a short extract of music. The two most important factors are that you can sing in tune and that you have a voice that will blend with the rest of the chorus. We are most definitely not looking for aspiring soloists! Members pay an annual subscription, currently £120, at the start of the season in September, pro rata if joining later, which includes the cost of all the scores loaned to you. However, for our annual performance of Handel’s Messiah you will be expected to own a personal copy (OUP, Bartlett Edition), which is available from the librarian at a discounted cost. Normally the subscription is paid in full on joining, but it may be possible to make a different arrangement with the Treasurer.